The Pak Chong police station was alerted at 2.30pm to the accident on Mitraparp road in Tambon Nong Daeng, Pak Chong district. 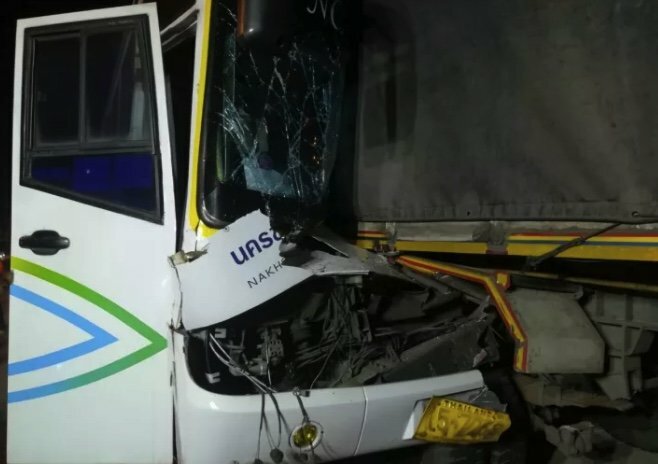 The bus driver, Thanawin Praping, 46, told police that he dozed off behind the wheel before his bus hit the truck’s back end. He said he left Khon Kaen at 10pm. Hard to follow the daily fatal bus accidents. Yesterday an grade 8 student, today a bus hostess. At least no cheap excuses. He said he left Khon Kaen at 10pm. Accident at 2:30 AM would make sense. 4:30h from KK to Pak Chong. When oh when are the authorities here going to do something to stop this daily carnage? Another bus driver falling asleep due to having to drive excessive hours. Left Khonkaen at 10.30 pm accident around 2.00 pm the next day, money, money, money that is al the bus owners care about, to hell with passenger safety, just make more money. Makes me wonder what this is about. I doubt the reporting. Khon Kaen to Pak Chong is not a 15.5 hour trip (280 km, about 4 hours). More like a trip time to Phuket. As I assume the accident was around 2 AM. It was a nightly accident around 2:30 AM this morning, March 19th. Just another example that night buses are dangerous. Maybe just after hooligan minivans 24/7. Thais could fall asleep on a washing line, even after 8 hours sleep. I've never been in a country where there're so many accidents through drivers dossing off. Sheer lack of common sense, like children in adult bodies. I think they are counting on Darwin. Do you think that the fatal motorcycle and car accidents reported in Thaivisa today are the only ones that took place? Statistically averaged about 60 people died on the roads yesterday. Did you see 60 reports? If all the other vehicle fatalities were reported with as much "enthusiasm" as the bus fatalities are there would be many more reports in Thaivisa today, given that bus fatalities make up only 1% of the road deaths in Thailand. That is the same % as the UK,US and many other countries. But the "news" always likes to report bus deaths, while ignoring most of the others. RIP to the poor hostess. I do hope the driver spends at least some time in jail and he is not given the customary 1500 baht fine and a two-year suspended sentence. I saw this bus in the roadside ditch this afternoon. Operated by a company well known for their driving style and number of accidents. I avoid to use them like hell. But even when using my own car they tried to chase me.